Today seems like a good day to bring back a classic post about a famous incandescent bulb in Livermore, California. Obviously, a few elements of this post are now out of date: the socialist regime of Barack Obama, and its would-be successor, to have been run by Hillary Clinton, have now been sent packing. Also, the Newcandescent bulb company discussed below has now apparently gone over to the LED market. I am compelled to admit that, since this was written, the quality of LED bulbs has improved significantly; but it must be said that a big part of the improvement is the extent to which LED bulbs can now imitate the light of incandescent bulbs. One thing that is not out of date is the Centennial Light itself which, as this re-post goes up, is still burning after 116 years. This light bulb hangs from the ceiling at Fire Station 6 on East Avenue in Livermore, California, where it serves as a night light over the fire trucks. Hand-blown with a carbon filament, it was manufactured at the Shelby Electric Company in Shelby, Ohio and first installed at Livermore's fire department horse cart house on L Street in 1901. It has been moved twice since then; since its most recent move, in 1976, it has been hooked up to its own independent power source, and has burned continuously without being turned off or going out. Consider this. The year this light bulb was installed was the same year that Queen Victoria died. It was the year President William McKinley was assassinated, and Teddy Roosevelt took his place in the White House. In 1901, Leo XIII was Pope in Rome; Winston Churchill was just beginning his extraordinary career in the House of Commons; the Panama Canal was still under construction; Douglas MacArthur was still a cadet at West Point; radio and motion pictures were still new inventions; the Wright Brothers' first flight at Kitty Hawk was still two years away, and it would be another seven years before Henry Ford's Model T would begin to roll off the assembly line. Since 1901, two world wars have ravaged the planet; most of the world's monarchies have toppled; the Soviet Union rose and fell; the Cold War raged; man took flight, first across continents and oceans, then to the moon and back; telephones, televisions, and above all computers have brought the entire world right into our homes. Through it all, this bulb has continued to shine. True, the Centennial Light is down to only a fraction of its original brightness; yet even its manufacturers, who prided themselves on making the best lamps in the world, could hardly have imagined how long this light's working life would continue. Nor is the Centennial Light the only bulb possessed of extraordinary longevity. 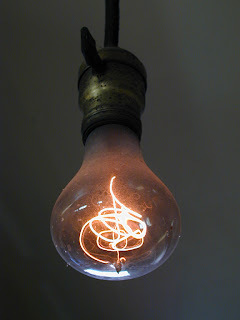 Others have been documented as having functioned for many decades, including one that has shone since 1908. Who knows how many other bulbs have worked for decades that nobody has documented? Truly, the incandescent light bulb is among the most useful devices ever come up with in the history of human innovation. So it makes perfect sense that the current socialist administration, whose ultimate goal is the moral and material enslavement of Americans, should make war upon the incandescent bulb and try to cram vastly inferior fluorescent bulbs down our throats. Let's face the facts about fluorescent bulbs -- and particularly the spaghetti bulbs meant to be installed in place of incandescent ones. Like virtually all other things liberals are always trying to force-feed us, fluorescent bulbs stink. They take forever to reach their full brightness, and their full brightness isn't much to write home about. They're costly. They're full of mercury, which makes them dangerous. They're worthless in an Easy-Bake Oven. And you can't just throw them out when they burn out, like you can incandescent bulbs. Fortunately, there is still a company in this country that manufactures incandescent bulbs. America's entrepreneurial spirit is still alive and well at Newcandescent, which legally manufactures incandescent bulbs. And they say their bulbs will last 7 years. I don't usually plug products on this blog, but I'm glad there's somebody still manufacturing incandescent bulbs in this country. Still, there is one thing that really sticks in my craw about it. Even if you are a fan of fluorescent bulbs, if you are a patriotic American and lover of liberty, you must acknowledge that greater principles are at stake than the preferability of incandescent over fluorescent. The fact that Newcandescent had to (a) redesign incandescent bulbs to comply with new federal requirements, and (b) apply to the Department of Energy for permission to manufacture the newly designed bulbs ought to fill you with rage. Did you ever think we'd reach a point in this country when American citizens would have to apply for permission from the federal government to manufacture incandescent bulbs on American soil? Was this what the Founding Fathers had in mind? Is there some provision of the Constitution, written, perhaps, in invisible ink, that gives the feds this authority? Was this what generations of patriots shed their blood in distant lands to protect? It's a shame to have to admit it, but the America upon which the Centennial Light first shone 111 years ago was a much freer one than the one we live in today. Our first order of business in this country is to straighten ourselves up as individuals, governing our passions, recovering our Christian morals and living according to right reason. Without this, nothing else will work. Our second order of business is to throw out the socialist bums that have seized power in this country at every level of government. Our third order of business is to reduce the federal government to its original constitutionally mandated functions, and every other level of government to reasonable proportions in accordance with state constitutions, common sense, and the principle of subsidiarity. And in the meantime, we should support entrepreneurial efforts like Newcandescent that prevent the useful things that improve our lives from being cast into oblivion by socialist elites.